Sometimes in life, you just run into something that shocks you. Sometimes they are horrible actions or events that change the very fabric and nature of our lives. Others are moments where love and compassion ring through and they reinforce our belief in humanity. Sometimes they are no more than a bunch of coincidences which are important only for a day or so, but still are quite shocking and entertaining. This Sunday, I had one of those moments, a moment where the odds of it happening were so astronomical that if you had bet a penny on it happening, you would be a billionaire today. Sunday started off like most normal Sundays do in Seoul, with the sun shining through the motel window and an aching head. Well, ok, my head wasn't wasn't aching, but most of my friends were beginning to regret their choices from the night before. Normally Sundays in Seoul are a good way to spend a day. The choices are limitless, but they normal consist of some form of shopping, a non-Korean lunch and maybe a little sightseeing. However, this weekend I had to get back to Seosan early because I was taking part in a Halloween party at a local company. Needless to say, noon still rolled around far too quickly and I needed to be on a bus no later than 1. After leaving our motel Hana and I headed to Central City Terminal so that I could catch my bus back. Instead of taking the subway we decided to take a taxi. It's only about 3 dollars and it's much faster than the subway provided there is no traffic. As we hop in the cab and start on our way to the bus terminal it's just a normal taxi ride. It's a ride I've made too many times to count and at this point I've pretty much tuned everything out. Then, it happens. I hear a bell ring as we make a turn. I thought to myself "That was strange." I didn't see a bell when I sat down, where did it come from. 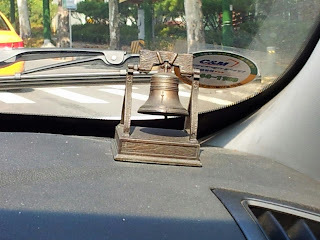 As I begin looking around I check all the normal places for a bell to be, and finally I see it, right in front of me. 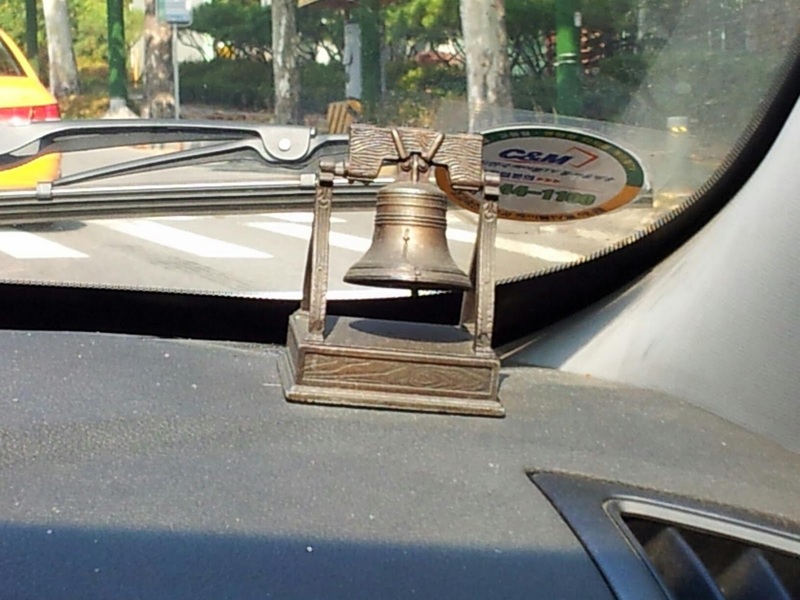 It's a small replica Liberty Bell, sitting on the dash. At first, I don't really pay it any attention beyond just a simple "Huh, it's the Liberty Bell." Then, all of the sudden, I pay a little more attention to it, and it hits me all of the sudden. This isn't just a replica of the Liberty Bell, but it's a pencil sharpener also. In fact, it's the exact same pencil sharpener that I had in 5th grade. While it's not the one I specifically had, what happened to that I don't know. It's probably somewhere in a landfill. However, this still is the exact same thing I had as a child. At this point I start acting like an idiot because I can't believe that it's the exact same pencil sharpener I had as a 5th grade student. It'd been almost 20 years since I'd seen anything like it. I don't even think I saw it the last time I was in Philadelphia at the Liberty Bell Center. Yet, here I am, in a taxi in Seoul, South Korea, and this taxi driver has one in his car. Besides the trip down memory lane, the sheer probability of this was boggling my mind. 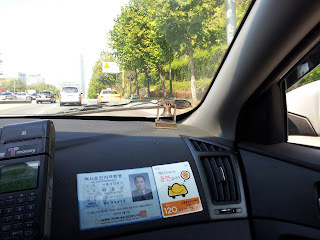 When you think about it, in a city of 10 million official residents, and almost 25 million in the capital area of Seoul and suburbs, and out of all the taxis in Seoul (easily over 100,000), I found the one taxi that had a replica Liberty Bell pencil sharpener in it. On top of all that, it's the exact same one that I had when I was in 5th grade. Now I know it was probably made in China, and the Korea is really close to China, but there really is no demand in Korea for Liberty Bell memorabilia. What were the odds of this? Honestly, what were the odds? 1 in a billion, 1 in a trillion. This was just one of those random events in life, where the chances of something happening, or ever happening again are astronomical. I have a better chance of winning a lottery I never played in Africa than ever having this happen again. Needless to say I remained shocked for the entire day and just marveled by the odds of all of it. I guess I should have bought that lottery ticket after all.